"I've always been influenced by the idea of Tivoli Gardens in Copenhagen, which was the inspiration for ultimately all modern amusements parks. I remember the beautiful theater pavilions with the curtains painted with peacock feathers that had little ballet performances. At Tivoli, there were rides, but more important than the rides were the cafes and the refreshments, and just the sense of being in a children's garden, a 'pleasure garden' for all people to enjoy – which perhaps is the best phrase to describe what we're creating here. This vision was replicated at places on Coney Island, like Luna Park, and George C. Tilyou's Steeplechase Park, or Palisades Park. 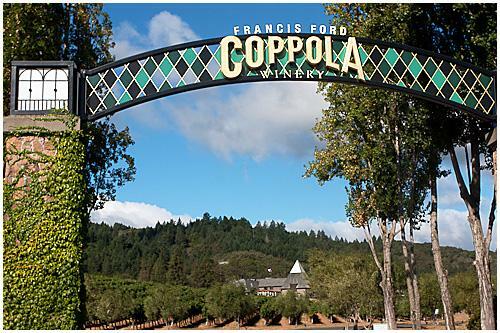 These were basically wonderlands, and I thought Francis Ford Coppola Winery could become such a park for the family to go and enjoy, where there are things for kids to do, so they can be close to their parents who are sampling wines and foods. I've often felt that modern life tends to separate all the ages too much. In the old days, the children lived with the parents and the grandparents, and the family unit each gave one another something very valuable. So when we began to develop the idea for this winery, we thought it should be like a resort, basically a wine wonderland, a park of pleasure where people of all ages can enjoy the best things in life – food, wine, music, dancing, games, swimming and performances of all types. A place to celebrate the love of life." "The character of this year's Claret expresses dark, succulent fruit, well-hewn tannins and dramatic spice notes accentuated by oak aging. Red magenta color with aromas of boysenberry, cherry, allspice, and smoky oak. On the palate there are flavors of cassis, blueberry, minerals, and anise."